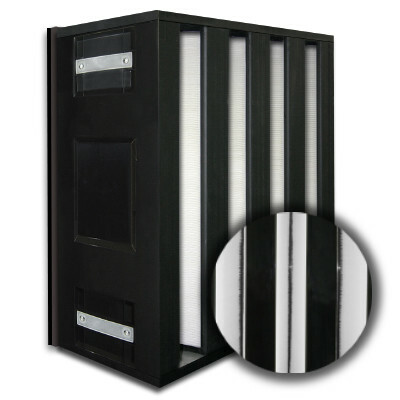 24x24x12 Black Box Puracel V-Bank Filter, GT Style, Single Header, No Gasket ASHRAE 95% MERV 15 | Air Filters, Inc.
Air Filters, Incorporated™ BlackBOX™ Turbo-V 24”x24”x12” ASHRAE 95% rigid box style V-Cell filter offers 20% percent additional filter area and can be installed as a direct replacements for older less efficient rigid cell filters. Perfectly designed for use in air filtration handler systems using filter banks and/or side access housings. These filters are specifically designed to withstand surging and pulsations due to centrifuge compressors, gas turbine and industrial engines. Black Box provides a superior combination of low pressure drop and high efficiency through the use of our unique mini-pleat design. This extended surface design ensures low resistance to airflow and reduce energy cost. Our Black Box™ Turbo-V box style V-Cell design can resist moisture and humidity associated within the air stream and are a perfect solution to reducing the cost associated with heating and cooling makeup air intake and recirculating applications for commercial, industrial and medial facilities. 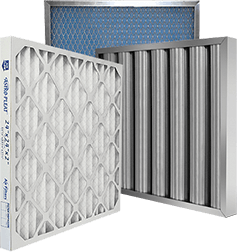 Air Filters, Incorporated™ BlackBOX™ Turbo-V ASHRAE 95% rigid box style V-Cell filters plastic frame is the best choice in filtration systems with high velocities, variable air volumes, high moisture. The lightweight Plastic frame installs easily into side-access housings or front-load holding frames and is an ideal choice to replace bag filters and other box-style rigid filters. •Recommended final pressure drop: 650Pa, 2.6” w.g. •Temp: 60-80˚C, 140-175˚F (Spike Conditions). 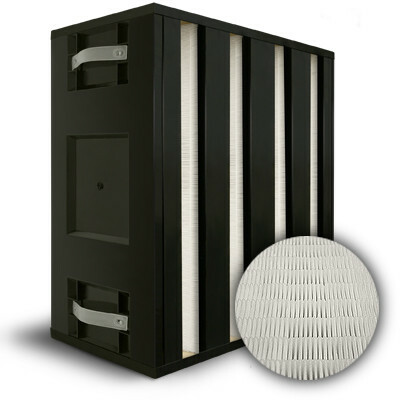 BlackBOX™ Turbo-V rigid box style V-Cell filters is constructed from plastic and secured to frame with specialized media sealant ensuring the elimination of air bypass. •Constructed of HIPS and ABS plastic. •Gasket for up-stream, down-stream or both (Optional). •Mini-pleat Design with glass fiber utilizing a hot melt bead separator.